All the employees of Zuche Pharmaceuticals understand that quality of the products is of utmost importance and hence everyone at Zuche abide by the following principles. We work with a commitment to provide globally acceptable high quality healthcare products and services. We continually review and improve our quality standards to fulfill the expectations of our consumers. We always strive to achieve our goals by training, upgrading and inspiring our team players. 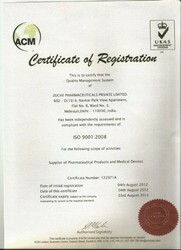 Zuche Pharmaceuticals Pvt. Ltd. is the favored choice of our customers for manufacturing, supplying and exporting Pharmaceutical Products. Our customers have believed in us for meeting the diversified demands and offering the best quality possible. We have always focused on meeting the several client needs within the promised time limit. Our hard work and regular efforts have garnered us with the leading clients in market.